As 2012 comes to an end we follow up our most pirated TV-shows chart by taking a look at the most pirated movies of the year. 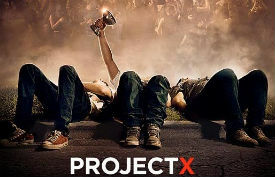 Project X comes out on top, and aside from other usual suspects such as box office hits The Dark Knight Rises and The Avengers, the list has a few notable absentees. With nearly 9 million downloads Project X leads our list of most shared movies on BitTorrent in 2012, leaving Mission: Impossible – Ghost Protocol and The Dark Knight Rises behind in second and third place respectively. There is no significant change in the total number of movie downloads compared to last year but it’s clear that demand for movies remains strong. Project X as “winner” is perhaps the biggest surprise as it’s the lowest grossing movie in the top 10 with only $100,931,865. As is the case every year, our top 10 list has a few notable absentees in 2012. These include the top grossing The Hunger Games and Skyfall. The latter is currently only available in a lower quality release, which explains its absence. Whether these unauthorized downloads are a serious threat to box office revenues is unclear. Earlier this year researchers found no evidence that BitTorrent piracy hurts US box office returns. There is a link between downloads and revenues internationally, which the researchers attributed to long release windows. However, looking at box office revenues is only half of the picture as DVD sales, rentals and on-demand movies are perhaps more likely to be impacted. The data for this list is collected by TorrentFreak from several sources, including reports from all major BitTorrent trackers. All release formats, including cammed versions, that are downloaded between January 1st and mid-December are counted.